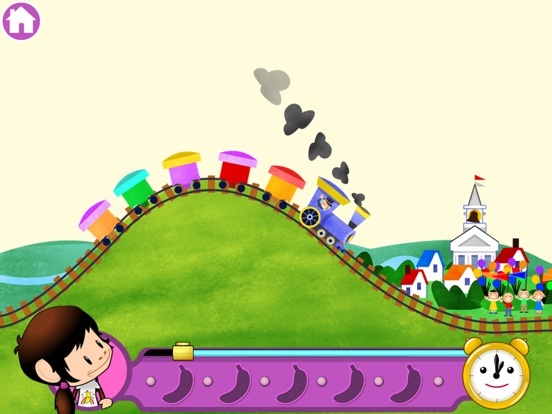 Race against the clock to successfully complete all activities and earn bananas before the time runs out. When it's all over, do the banana dance. Kids will go bananas over the learning games found in Zuzu’s Bananas, an app in the Monkey Preschool family. 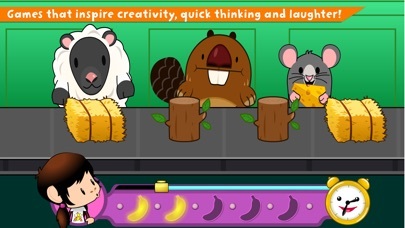 This high energy app focuses on fun while helping young kids build some basic skills. They’ll get to make baskets and kick goals, match objects, and complete nearly 50 different activities. 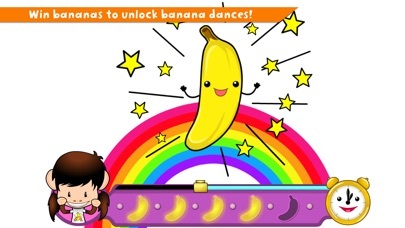 Best of all, after collecting enough bananas, kids get to unlock the banana dance. After taking a short banana dance break, however, they can jump right back into the games and learn about helping, sharing, matching, and building fine motor skills at the same time. 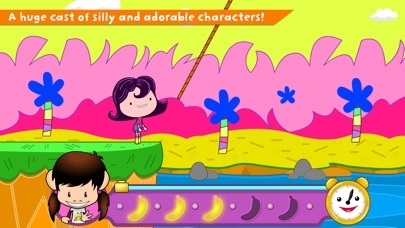 Fun animations and zany sound effects fill this exciting preschool app. Kids will find it easy to navigate and fairly easy to play. However, the frantic pace at which the app moves lowers it quality score a bit. Kids must complete each activity within a specific time frame and as soon as the time is up, the app jumps right into the next activity. 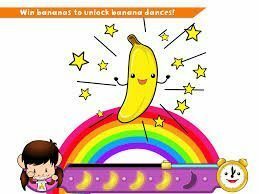 Aside from a banana dance party every few activities, there isn’t a lot of time for kids to stop and catch their breath which can become very frustrating and make it hard to follow the games. Parents can adjust the timer speed or even turn it off for some of the games, but that doesn’t account for the lack of time between each activity. More subtly educational than some other Monkey Preschool apps, Zuzu’s Bananas still has some good lessons built in. For example, kids must match baby animals with their mothers, find matches on a puzzle, and match animals with the food they eat. 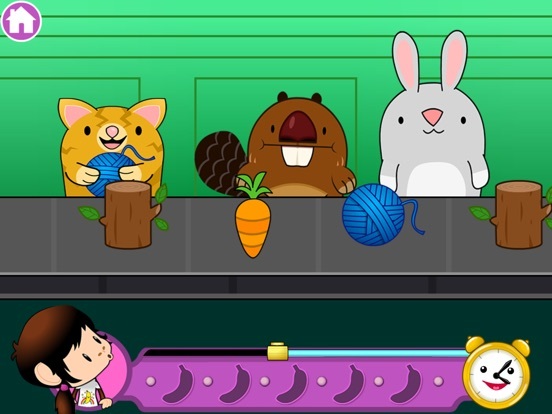 They must also share by passing carrots between two bunnies, learn to help by getting a train over a hill, and just developing other key motor skills by popping, catching, kicking, and completing other tasks within the game. While the simplicity of some of the activities may make seem like it’s designed more for toddlers, the time limit makes it ideal for preschoolers and kindergarteners. Many of the activities are actually pretty challenging when you consider kids have to think quickly to get them done. The Knack option in the parent section allows the game to adjust levels to help make the games more or less challenging for kids based on their performance. While the educational components may be a little more subtle, the entertainment components are not. From the variety of activities to the frantic pace at which kids must complete the activities before time runs out, the game encourages kids to keep playing. They’re rewarded with bananas and, after a series of activities, a short banana dance break that will surely have them bopping along to the beat. 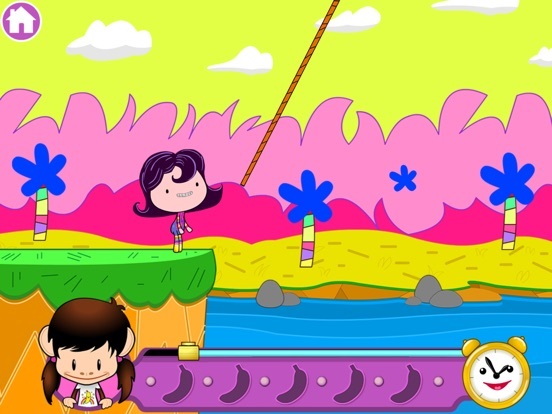 Zuzu’s Bananas comes with a large selection of games and proves to be a lot of fun for kids. If they’re fans of other Monkey Preschool apps they’ll definitely enjoy this one as it incorporates some of the same characters and similar ideas in the format of the games, even though it’s less educational. On the main screen of the app, kids will see a small square advertising more developer apps and a “for grownups” section. Both sections are contained within protected areas. In the grown ups area, parents can adjust the settings (turn the timer off or slow it down and turn the knack option on or off), access social media, and sign up for the developer’s e-mail list. Kids will be most attracted to the giant play button and get started with the activities right away. They have to pay attention from the beginning though because the game moves fast.